Villa Thomasamayley is set high in the hills. There is fantastic scenery all around. To the front there are olive groves leading down to Lake Vinuela, and mountain views to be seen in every direction. In the distance on a clear day you can see Torre del Mar and the sea, to the left you have the typical Spanish village of Alcaucin nestling in the Sierra Tejada mountain side. Our villa occupies a large area, there is a large 30ft by 15ft swimming pool and a sun terrace.There is a poolside casita with shower and toilet. The area is good for walking. The National Foerest is nearby. We have had our 3 bedroom Villa for 14 years we enjoy spending time there we also enjoy finding different places of interest in the surrounding areas, the scenery is amazing. 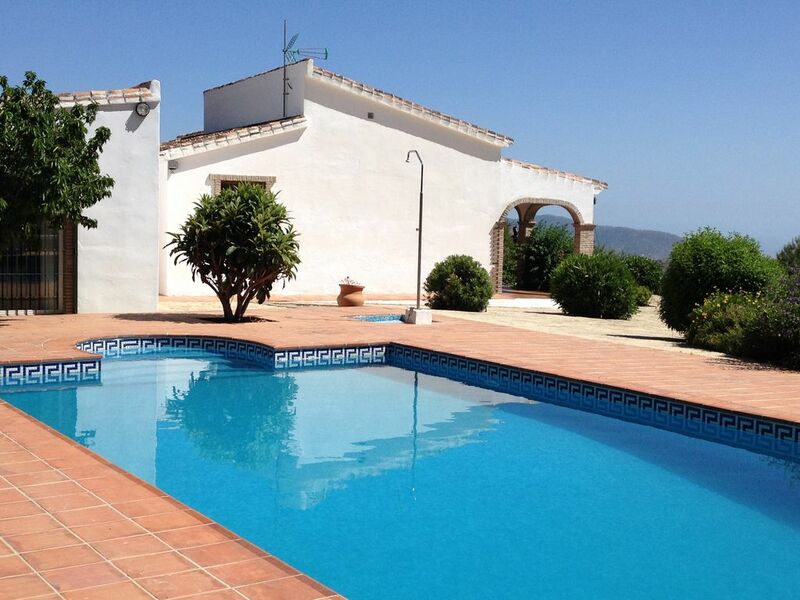 The Villa is opposite to our 2 bedroom villa which is also advertised on the Owners Direct site. Our Villa has a large swimming pool set in spacious grounds with shrubs and trees.It includes a field in front and a hill to the side. Small en-suite bathroom to 1 twin bedroom. Separate bathroom. Poolside casita with shower and toilet. Kitchen, fully equipped with washing machine and dishwasher. Microwave. Fridge freezer. Our 3 bed villa has a lovely garden which goes right round the villa ,casita and pool,there is a field infront and a large area of land at the side ,our hill, with fantastic fiews at the top. Notes on accommodation: The villa has a wood burning fire and mobile heaters and electric radiators. Outside: Large 30ft x 15ft swimming pool and a sun terrace, with poolside and terrace furniture and a barbecue. Further land leading to hilltop where you can see the most fantastic scenery in every direction. Cleaning / Towels / Linen / Maid service: All linen and towels are provided. Other: Poolside casita with shower and toilet extra living area. The area is 20 minutes from the coast (Torre del Mar)and 35 minutes to Nerja. There is a large shopping center 20 mins. 30 minutes from Nerja, and about 2 hours to Sierra Nevada where there is a fantastic ski resort catering for all levels of ability. Alcaucin is 10 minutes away and Puente don Manuel is 5 minutes by car. In Puente there are 2 mini supermarkets and a few restaurants. Lakeside restaurants 10 mins away. Restaurants in nearby village. 5 mins by car.